A description of step 3 of the Sinclair Method to beat alcoholism or alcohol use disorder using Naltrexone or Nalmafene tablets. Chapter 1 described how naltrexone was approved for the treatment of drinking problems by the FDA in 1994 in the United States and subsequently by medical authorities in many other countries. Back then, the World Health Organisation endorse naltrexone, and the NIAAA confirmed it was the first truly effective medication to help in the battle with addictive drinking. But it took another twelve years for the American Medical Association (AMA) to acknowledge that naltrexone should be widely used for alcoholism in general medical settings with its May 2006 publication of the results of Project COMBINE, the largest multicentre clinical trial in the history of addiction research. Unfortunately, the fact that naltrexone is not a sufficient ingredient in itself generally remains underreported. In other words, it will not work on its own together with abstinence. Most doctors and patients assume that medications are taken or specific illnesses or conditions. Thus, aspirin helps reduce pain, antibiotics cure bacterial infections, and insulin controls diabetes. Doctors write out prescriptions for medications. Patients follow doctors’ orders and take the medications, which are presumed to have inherent healing properties. Whilst most medications – antibiotics, antihypertensives, or antidepressants – may work like magic, the patient need do little apart from taking the medication. Although pharmaceutical companies list every conceivable drug side effect for legal reasons, they characterise naltrexone as a well- tolerated, safe, nonabusable medication. Naltrexone (50mg) was first branded as Revia ™ in the United States and in several other countries. In the United Kingdom, it is branded as Nalorex ®. it is also sold under the brand name Depade ® in the United States. Other brand names for naltrexone include Naltima and Nodict (India), Narpan (Malaysia), Antaxone and Celupan (Spain), and Narcoral (Italy). The long-acting monthly injectable form of naltrexone is branded as Vivitrol ® in the United States. 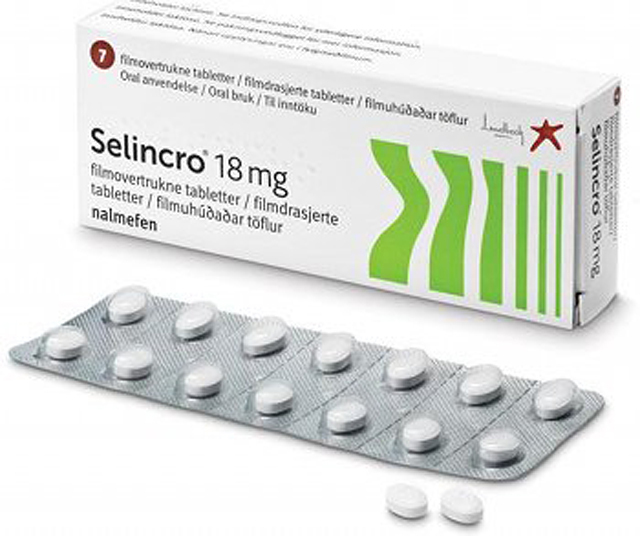 The equivalent dosage of nalmefene (18mg) is branded as Selincro ® across Europe. What Does It Feel Like to Drink While Taking Naltrexone or Nalmefene? If you took naltrexone or nalmefene without drinking, your would feel about as much as you would if you took a multivitamin – virtually nothing. Fewer than 10% of patients reported temporary nausea in clinical trials in which it was given to abstinent patients. It produced even fewer side effects in patients who were still drinking. The medication is not psychoactive, and it will not make you feel high or low. Naltrexone or nalmefene does not bring relief from alcohol craving like a painkiller relieves a headache. Some patients report they do not get a ‘buzz’ from the first drink when they begin drinking while taking naltrexone or nalmefene. However, even when you do take it together with alcohol, you do not subjectively feel it working in your system. One of the nice features of naltrexone, nalmefene and other opioid antagonists is that the endorohin system they block is relatively unimportant most of the time. Endorphins are involved in many forms of reinforcement, but usually as just a backup or shortcut system. Their role as painkillers may be important in the wild, where animals often have to function despite severe injury in order to survive, but in our modern world, we are seldom faced with such challenges. Other neurochemicals that modulate behaviour, such as dopamine, serotonin, and epinephrine, are critically involved in the regulation of vast numbers of activities, and one must be very careful with drugs that alter these systems. With the endorphin system, however, most people can’t even tell if it has been blocked by an antagonist such as naltrexone. Indeed, that has been tested in some of the double-blind clinical trials in order to demonstrate that the patients really could not tell if they had been given an opioid antagonist or a placebo. That is not rational, you might complain. No, it is not, and the reason is that alcohol abuse is not a rational behaviour chosen logically for its ability to produce euphoria. Studies of human social drinkers show that euphoria is only occasionally increased alcohol. If you are in a melancholy mood, red wine will make you bluer. If you in a party mood, you will fly through the air on bubbles of champagne. If you are feeling frustrated, you may become aggressive – hence, the violence associated with drinking and crime. If you are in a hospital gown in a stainless steel laboratory at nine o’clock in the morning with nothing to eat or drink, alcohol will not produce euphoria – as was demonstrated in one PET brain scan study in Finland on the effects of alcohol. The study demonstrated nicely some of the immediate effects of alcohol on the brain, and it showed that an opioid antagonist blocked these effects. The researchers had hoped to measure if it was blocking euphoria as well, but failed because the alcohol did not produce any significant increases in euphoria under stark laboratory conditions. Because naltrexone and nalmefene are opioid antagonists, it cannot be abused. You cannot get high from it as you can with tranquilisers or many other prescription drugs. Naltrexone and nalmefene pose no addictive risks. Therefore, physicians can feel safe about prescribing it in general medical settings. The normal dose is 50mg of naltrexone to be taken an hour before drinking alcohol. Some doctors recommend that you begin treatment with half the normal dose (25mg) by breaking the tablet in half. This is recommended to help you get used to taking the medication on the first two or three drinking sessions. Your doctor will require a blood tests before prescribing naltrexone to check for cases of existing liver damage. The reason for this is that one study using massive doses of naltrexone (3oo mg daily) found they were stressful to the liver. There is no evidence that any lower doses of naltrexone stress the liver. Moreover, one of the common measures showing the effectiveness of naltrexone is that the same measures of liver damage improve as a result of the treatment. Nevertheless, it was felt that naltrexone should not be given to people who already had severe damage to their livers, so a liver function test is needed, and a small percentage of patients will not be able to start naltrexone. Although 100-150 mg doses are occasionally prescribed in special cases, you must stay within the recommended dosage and not take more than the usual 50 mg dose of naltrexone without consulting your physician – taking a higher dose will not speed up your three to four month de-addiction process. A dose of 50mg should block 100% of the opioid receptors for most people; doses of 100 or 150 mg still only block 100% of the receptors, and thus do not accelerate the treatment. If you are a weekend drinker, only take your medication on weekends. Do not take it during the week, unless of course you find yourself drinking during the week. If you drink ever day, take your medication every day. If you drink six days a week, take it six times during the week, one hour before you have a drink. If you find you have the urge to drink and have accidentally had a drink without taking your medication, take your tablet immediately. Always keep the medication with you. Some people keep their medication on their person for years, even after choosing to abstain completely – just in case. The main objective of Step Three is to secure your prescription for naltrexone or nalmefene. In practise, most physicians in the United States will be pleased to write you a prescription for naltrexone – especially because the AMA published the results of Project COMBINE in May 2006 endorsing the use of naltrexone for alcoholism in general medical settings.